Emphasis provides dynamic paragraph-specific anchor links and the ability to highlight text in a document, all of which is made available in the URL hash so it can be emailed, bookmarked, or shared. I adapted the New York Time’s implementation into a three-line WordPress plugin for my own site, and it is available in the WordPress plugin repository as a one-click install, if you would like to add it to your own. 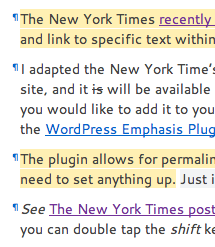 The “deep links” plugin allows for permalinking and highlighting of text on a paragraph and sentence level. No need to set anything up. Just install, tap shift twice, and start highlighting.